Expectation is a large ephemeral sand painting portraying the likeness of Barack Obama, located in the Catalan city of Barcelona. 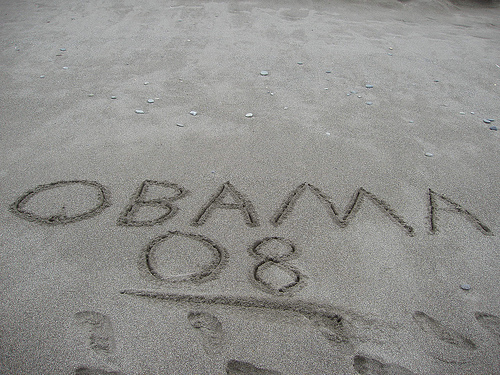 It was created before the 2008 US presidential election using a large-scale vector graphic, a GPS topography system and approximately 650 tons of sand. The work’s grand scale (1 hectare / 2.5 acres) embodies the immense sense of hope felt by Barack Obama’s supporters and raises a mirror to reflect the source of that hope. Obama has awakened an enormous yearning for change that runs deep beneath decades of disaffection with the political establishment.